“Automatic Identification System,” more commonly referred to as AIS, is both a piece of electronics equipment, and a system presently in use among both large vessels and small for keeping track of one another. I’ve referred to this device several times over the course of the blog, but it really deserves its own post. Now is a nice time because the previous post, “Grease Pencils,” happens to include the AIS that’s installed aboard AUKLET, in the top photo. That’s the gray screen in the lower right corner of that first picture, also copied above. In a perfect world, I would have a photo of the gizmo in operation, displaying a variety of other vessels in the neighborhood. The next time that the boat is in the water, I’m going to remember to take that picture! In the meantime, there’s a good bit to say about it. The AIS system uses a particular kind of device, but there are quite a number of different pieces of equipment available from different manufacturers that actually do the job. Like a VHF radio, any company that wants to can produce their own versions. Some varieties have their own screen, and others are little black boxes that connect to an existing chartplotter, or to a computer. In addition to some kind of screen, the equipment requires an external VHF antenna, and almost always a dedicated external GPS antenna. I chose the “Vesper Marine Watchmate 850” (nope, not receiving anything) for several reasons. Most important for my situation, it has its own screen, and uses less power than equivalent competitors. It’s also waterproof, which relieves stress about splashes and rain in the companionway, where it’s mounted for visibility from both cabin and cockpit. In some situations, this model does not need a separate GPS antenna, but the tech person at the company suggested that it would be more secure to have one, with which I agreed – why go through all this only to have questions about GPS signal acquisition. The small external GPS antenna can be mounted flush on the top of the cabin, and has not been a problem. 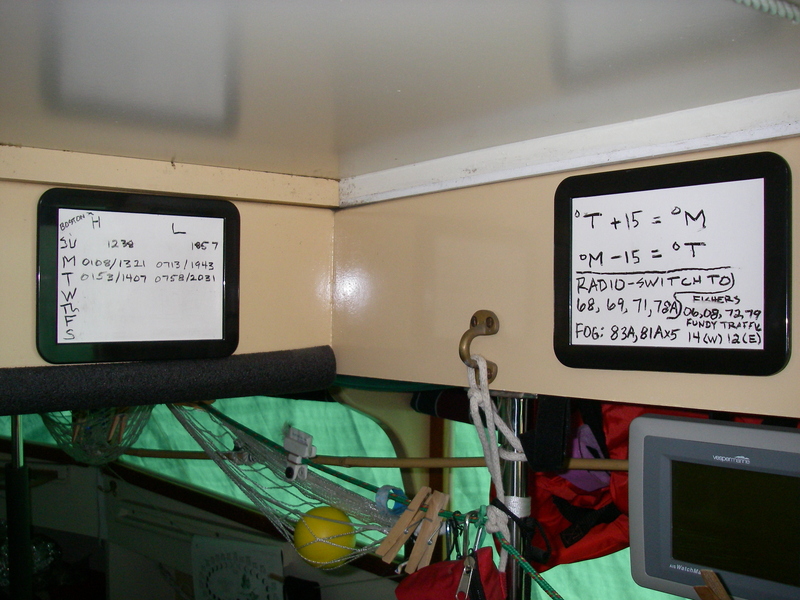 Overall, the installation did feel like a bit of a production: VHF antenna on the mast, cable through a cable clam on the deck, GPS antenna hole in the cabin, cables run back to the equipment, and to top it all off, wiring for power. Sheesh! But the first time that I was out in Long Island sound, and the gizmo told me about every ferry for 12 miles around, it was all worth it. AIS systems work using VHF radio signals, transmitting and receiving in short, digital bursts (rather like text messaging in cell phones). As a result, even when transmitting, electricity usage is quite small. I have often wished for radar, especially in the fog, but the power requirements have felt unmanageable. AIS now handles a big part of what radar can do, and in some ways does a better job. All large commercial vessels are now required to use it, and it’s becoming quite popular with recreational vessels. Not so much with commercial fishing boats, but I’m willing to bet that this might gradually change, especially because the equipment means that you can find your friends in the fog, keeping track of entire fleets with ease. In the meantime, both large ships and fast-moving ferries use AIS consistently. Additionally, fast-moving whalewatch vessels, and excursion boats (like the ones with 50 people with fishing rods over the side) also use it. This has been a great blessing, as the high-speed whalewatch boats have been a particular hazard in the places where I sail. The built-in screen is laid out like a radar screen, with your own boat in the middle and concentric circles around it showing range; on that screen you can see every boat that has an AIS transmitter. In addition to the position of each boat, its little triangle symbol shows which way it’s going, and informational boxes tell you everything from the course and speed of each of those targets to their names and how close you will come if both of you hold the same course and speed; it also tells you how long it’s going to take to arrive at that closest point. The gizmo is busy calculating all that, and depending on how you set it up it’ll beep to draw your attention to any potential problem. It was nice to hear about the daytime ferries in Long Island sound; the first time the new piece of equipment showed me a whalewatch boat moving at 27 knots in thick fog and going to pass at 1/4 mile, I started seriously blessing it. When the whalewatch captain called me on the radio to talk about that the return from my (giant) radar reflector was entirely lost in the “clutter” on his screen, but that my AIS signal was perfectly clear, I was ready to hug everyone remotely connected to this piece of equipment being on my boat – including the folks in New Zealand who built it. I’ve spent a lot of time in the fog worrying about getting run over, by everything from fast ferries to enormous ships. Peering into the grayness, and listening intently, taking bearings on ships’ foghorns, reassuring myself that the bearings are changing with each two-minute interval’s blast, which demonstrates that the ships are passing somewhere else. And then listening again, for the next one. 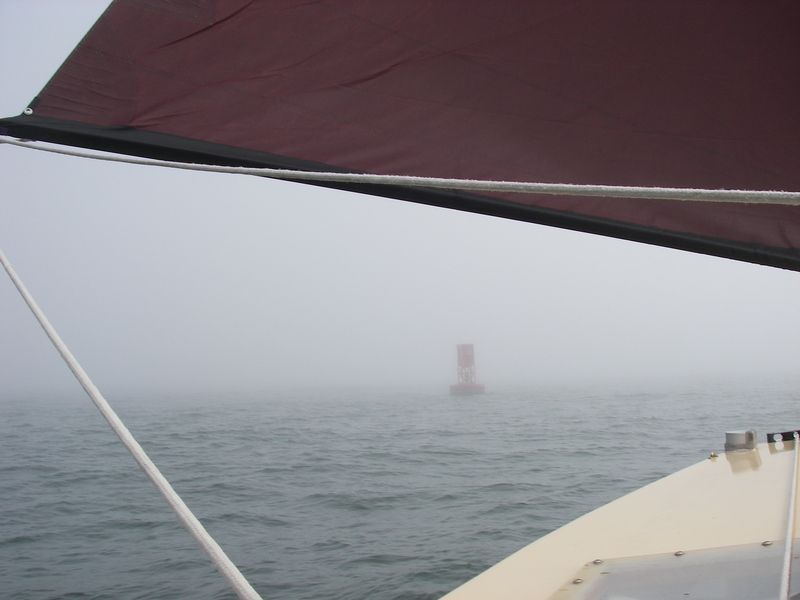 You can say, “don’t go out in the fog,” but that doesn’t do much for you if the fog arrives three hours after you’ve hauled up the anchor and sailed away… AIS doesn’t solve the problem of smaller fast-moving boats that don’t use it, and there’s still a lot of listening, and peering, but some of the problems are vastly reduced. Even on a clear day, a ship can sneak up awfully fast – but not now! It’s a real relief. Another interesting thing that happens with the AIS is that a whole lot of boats never turn them off, even when they are settled in their harbor, or at a dock for the night. I don’t quite understand this, but it has the fascinating effect of marking major harbors’ positions on the screen. All those resting boats make a black patch of overlapping triangles right there on the harbor’s location, that’s impossible to miss. For example, say you have the screen resolution adjusted for 12 miles out from your position, and Bar Harbor is about 6 miles away. This happened, that night that there was no wind and I floated around watching the phosphorescent streaks from the fish. Lying down to rest, with the AIS screen lit softly in the dark, you could see clearly where the boat was in relation to Bar Harbor, without doing anything at all. It was possible to see if the boat was drifting where it shouldn’t, or to confirm that it wasn’t going anywhere, with just a glance. Now, if I would simply get a handheld chartplotter, I could be doing this on a regular basis with a lot more precision. But I’m a holdout, and continue with everything from traditional navigation techniques to plotting the latitude and longitude coordinates provided by the GPS. Something about not relying too heavily on fallible electronics… But on those long overnight sails, I sure have enjoyed that easy little trick! This particular AIS unit gives one the choice to either be transmitting or to switch to “receive only,” which uses less electricity, and tells you about other boats but does not tell them about you. I find that I go back and forth between these settings, transmitting at night where there might be any traffic at all, and always in the fog, but not so much in daytime and good weather. As far as I can see, the biggest potential problem with leaving the transmitter off is if another AIS-equipped vessel is approaching, also with its transmitter off. In this case, neither can see the other, whereas if one has one’s own transmitter operating, at least the other vessel will be alerted to any close approach. In spite of this issue, being almost entirely under sail, I sometimes turn off the transmitter because it’s just too embarrassing to think of my crazy, halting progress, tacking in minimal wind and who knows what current, all over some tiny stretch of coast for hours – and having that not only observed, but recorded by every AIS-equipped boat in range of the antenna on top of the mast. Of course with the AIS placed in “silent mode,” the boat will still show up on other boats’ radar – but at least the radar image won’t have my name! As if that tracking embarrassment wasn’t enough, AIS transmissions are also picked up and included on a website that’s open to the general public. I haven’t investigated this – it’s possible that the website is something like marinetraffic.com – but theoretically if you know the name of a transmitting vessel you can do a search, and locate that vessel’s position. Suzanne tried to find AUKLET last year on the computer, but wasn’t successful, even though I did have the transmitter turned on at the time. I’ve been kind of happy about that, and have not made an effort to learn the system – it’s a wild world, all these electronics, and has already far crossed the line into “invasive.” It took me about five years to get over the concept of caller ID on the telephone, though nowadays I do finally like it. Maybe that’ll happen with my feelings about AIS tracking on the computer, but for now, it sure is nice to “run silent.” It’s always a treat to leave the transmitter off, and to sail around with more regular anonymity, sort of like how boats used to be. Even though I do like knowing about the ships. So that’s about it. The big brother aspect isn’t so exciting, but I mostly think back to that whalewatch boat speeding along in the fog, that never would’ve seen my giant radar reflector lost in the sea clutter, and was originally headed straight toward us. It eventually passed at a half a mile, and I still couldn’t see it. But thanks to the AIS, I knew exactly where it was. Pricey thing! Too bad, since your encounter with that high-speed whale watch boat (and just how does he justify anything like that kind of speed in fog?!!) gave me a strong visceral reaction–never mind the boat is in the garage and I’m sitting safely at my computer! It’s true, AIS equipment has a serious price tag. I found that Defender had the best price, and since I was planning ahead, I bought the AIS and antennas during their big annual sale in March, when everything in the catalog is 10% off. That helped quite a bit. As time goes on, like all sorts of other new electronics, hopefully the cost will come down. As far as high-speed vessels in the fog, I agree – both scary, and hard to understand. Oddly, given the colregs, the big commercial vessels all seem to go much faster than would allow for stopping or turning by the time they see an obstacle in the fog. That’s tough for small boats that might be out there, especially when there are a lot of waves (like in the situation I described) so the sea clutter makes it impossible to see small images on the radar. I’ve noticed that quite a few recreational boats in Maine do “Securite” calls on the radio, when the visibility gets really bad, to announce their position, course, speed and sometimes destination. Doing that is one way to be proactive about the situation in fog, and I’ve taken to occasionally doing the same thing, even while having the AIS transmitting, in hopes of reaching commercial fishing as well as recreational boats that are not using AIS.